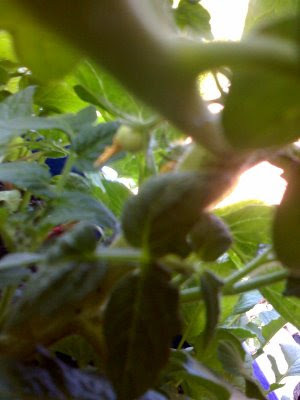 Yesterday Hubby took a picture of our first tomato of 2009! (Look towards the back of the plant and find that little green ball shape.) We are so excited! I hope our plant remains healthy and these little goodies just keep growing and growing! There's nothing more tasty to me than a home grown mater!